*This one is a week late as I have been travelling the wilderness and now I finally have an internet connection once more. Enjoy! The final eight. It all comes down this! Like the first episode of season five, we were teased with another bleak glimpse into Walter’s future. At first I did not even recognize the house, but it became quite apparent who’s place it was after someone spray-painted ‘Heseinberg’ across the wall in big fluorescent letters. The show has been using these flash forwards’ sparingly thus far, but I think it will become a habit in the remaining episodes. I completely forgot about the ricin, and as Walt leaves his house and sees his now former neighbor and sinisterly utters “Hello Carol”, chills came over me and I sat there both confused and enthralled as the smoky credits rolled. 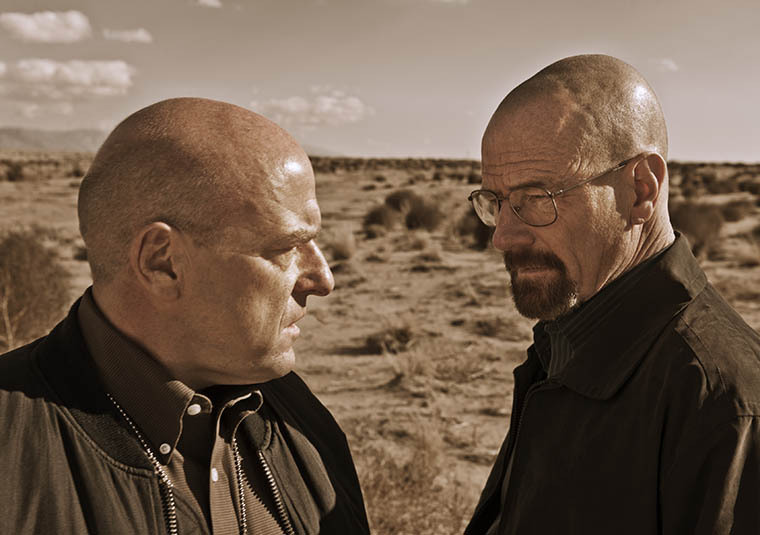 With these final episodes there is not alot to piece together anymore, and so I was pleased that they jumped right into the conflict between Hank and Walt. From his subsequent mini panic-attack to him slowly putting the pieces into place, Hank was the star of the episode. In no way will this little game of cat and mouse end good for either of them, and Hank realises this. Walt has destroyed many families, least of all his own, and yet seeing him toy with Hank and Marie is still heartbreaking. This is not only the end of the White family, but the Schrader family as well. The confrontation between the two was wonderfully laced with tension. The set up of Walt finding the bug on his car and then nonchalantly bringing it up to Hank was awesome. The purposeful confusion in Walt’s tone followed by both the fear and perhaps sorrow on Hank’s face was poignant. Walt has played this little game before, and won. Why should he expect a different outcome here? “If you don’t know who I am, then maybe your best course would be to tread lightly,” Walt states in a subtle manner that could be threatening. It gives Hank enough of a hint to be careful, but also a warning that he must be damned sure of his accusation or else he will be dragged down alongside Walt. The rest of the episode was made up of small, but very important scenes, as the world falls apart for the other characters, in particular Jesse. Jesse always wanted the money and potential fame that came from manufacturing the meth. However, what followed made him, and Walt, infamous. Now all of these decisions are having their toll on him mentally and it shows. Jesse trying to act like a Robin Hood-esque figure and giving away all his so called blood money is noble and hopefully he will come to redeem himself. If there is one character who deserves a chance it is Pinkman. I just fear this redemption will result in bloodshed-hopefully not his own. “Blood Money” perfectly set the tone of what’s to come. With enough mysteries being solved now, the subtle foreshadowing is refreshing and gives viewers a final, bitter hint of the end. Enjoy the ride folks, it’s going to be a bumpy one. *Note: The symbolism in this show has always been great, and this week was no exception. Walter donning the pure, “innocent” white suit; Marie laughing at Walt’s joke at dinner as she calls him the devil, the camera coming to fix on Walt; Walt laying down the cloth before being sick, as Gus did so long ago. These little things are what make the show stand out and continuously amazing.